Turkey and all the trimmings are a staple for Americans on Thanksgiving, and that doesn't have to change for Americans in space. Astronaut food has come a long way from the early days of human spaceflight, and crewmembers on the International Space Station these days can enjoy many Turkey Day traditions, such as cornbread stuffing, yams, mashed potatoes, cherry blueberry cobbler, and, of course, turkey itself. This year, NASA astronaut Kevin Ford, commander of the space station's Expedition 34 mission, will celebrate with his Russian crewmates Evgeny Tarelkin and Oleg Novitskiy. 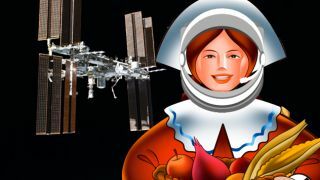 The space station's Thanksgiving delicacies will come in somewhat different forms than what may be on most holiday tables, though. Space food falls into two categories: freeze-dried (just add water) or thermostabilized (comes in a pouch). And all food sent to the space station has to meet certain microbiological requirements and have a sufficient shelf life. For example, the cornbread dressing on offer is a replacement for the traditional bread-based stuffing that many people are used to. However, break makes too many crumbs that float around in all directions in weightlessness and are difficult to clean up. Still, the current Thanksgiving menu is a huge improvement over what earlier space travelers had available. "If you want to go all the way back to Mercury and Gemini, there were no holiday meals back then," Kloeris told SPACE.com. "All you had was cube foods and tube foods. We've definitely expanded greatly the amount of traditional items that we have made available for holiday times, and that only makes sense because when we started having crewmembers stay on space station long term, we knew every year we'd be hitting Thanksgiving and Christmas with somebody." In addition to the standard holiday menu items, each astronaut gets a certain number of "bonus containers" to pack whatever particular foods they'd like, provided they meet the basic requirements. Most pack off-the-shelf products like cookies and other treats. "We have crewmembers who take icing in tubs and cookies, and they’ll ice them at Christmas time," Kloeris said. "We've even had crewmembers take food coloring so they could color the icing." The importance of having traditional holiday foods varies from crewmember to crewmember, she said. "That's always evident when they go to plan their bonus containers. You immediately know who has the strongest ties to holiday food because they’ll be the first ones to bring up the fact that, 'Hey, I'm going to be up there at Christmas.'" Each of the holiday foods that are provided by NASA have made it through a thorough vetting process. It starts with a basic recipe for, say, cherry blueberry cobbler. Then the NASA food scientists modify the recipe so that it can be packed in pouches, which is similar to canning. After that, they test its texture, color, and taste. "When it goes through the thermostabilizing process, the chemistry of the food changes quite a bit," Kloeris said. "Often what happens is we'll take a formulation and we'll try it afterwards, and it's like, 'No, that’s not acceptable.'" The scientists often have to go through many iterations of a recipe, including scaling it up so it still tastes good if made in large batches, before a food is ready for orbit. And some recipes just never quite make it. "We tried for a while to come up with thermostabilized cheesecake, and we just flat gave up on it," Kloeris said. "The color changes we got were just too severe. Not everything works." But other foods that are stereotypically associated with space are actually rarely eaten there. "The freeze-dried ice cream actually only flew once" on an Apollo mission, when a crewmember requested it, Kloeris said. "It's more like hard cotton candy. Certainly if [astronauts] wanted to request that they could, but that's not something that adults want. Kids like it; they sell it at the gift shop."